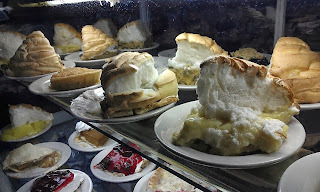 If you want to draw a bunch of animators to a small college town on the eastern edge of South Dakota, the most compelling enticement is obviously pie and ice cream. SoDak Animation Festival in Brookings, SD, knows the straight path to my heart. The festival is the combined effort of animator and professor Cable Hardin and the enthusiastic animation students at SDSU. In the middle of endless fields of corn and soy, the local and student community gathers to celebrate visiting animators and their films from around the world, culminating in the presentation of the Golden Cowbell Awards. Brookings is not an easy place to get to, but those who make the effort will be welcomed with MidWestern hospitality. This festival really has its heart in the right place. Cable Hardin, the festival’s founder and head of the animation program at SDSU says, “Without the filmmakers present, it’s just a bunch of movies”. 100% of the (very reasonable) entry fees are collected in a filmmaker travel fund to help cover some of the travel costs for participants. This is so rare in the US and it’s a smart way to entice budget-conscious animators to make the trip to Brookings. Our small group of animators and festival guests were chauffeured around town by hard-working volunteers and treated to home cooked meals, local brews and a special outing across the prairie in search of pie and pipestone. 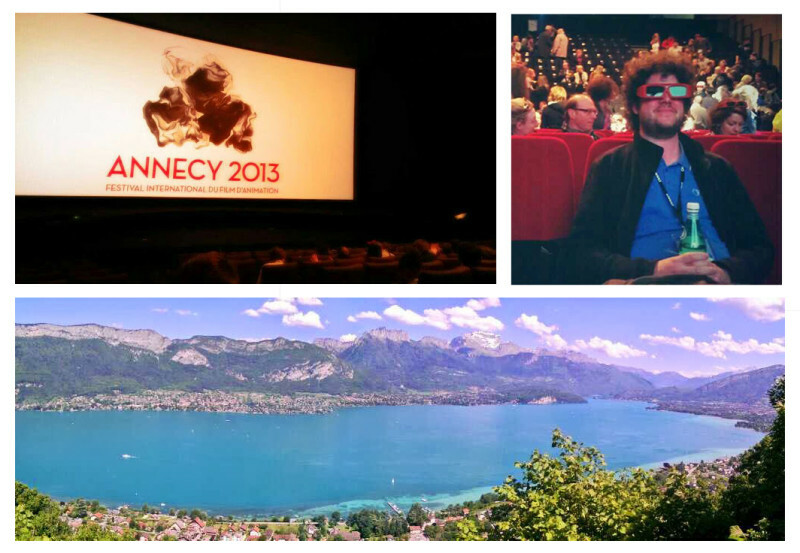 I was on this year’s jury so I had the opportunity to see every film in the festival. The majority were solid pieces of filmmaking, mostly narrative and character driven with a few more experimental works thrown in to keep things spicy. Techniques varied from highly polished CG to traditional cel and stopmotion I could tell it was a program meant to be both enjoyed by the public and inspiring to the next generation of animators studying at SDSU. Only the family program lacked a high ratio of well-crafted animation eyesores. Kids don’t seem to mind amateur stopmotion as long as there are fuzzy animals and dragons. Beautiful, imaginative cut-out film with mind-blowing in-camera effects. Subtle observation of a young boy working through a great loss. As strange and wonderful as the surrealist himself. Cody Walzel (Breadheads), Ann Mendenhall and Stephanie Son (Bird and Fish) were there in person to accept their awards, but as an extra special treat, the other award winners sent in some very creative acceptance speech videos, bringing a little bit of France, Taiwan, and London to the awards ceremony. One of the things I enjoyed most was the panel discussion on All Things Animation. The other panelists were Steven Hunter from Pixar, Eric Say from NBC graphics division and Jeff Hayne at Mill Creek Entertainment. Sitting on comfortable couches in front of a full house, we had a lively discussion on our respective roles in the industry, fueled by an endless stream of questions from audience. The conversation was peppered with personal anecdotes from Steve’s work on Nemo, Incredibles and Brave, Jeff’s mission to revive his favorite childhood cartoons for modern audiences. Eric revealed that millions of Americans don’t know that their Monday Football experience is sometimes entirely dependent on an unathletic animator running down the hall with a tape seconds before broadcast. We spoke about commercialism vs. creativity, the changing nature of distribution and funding, risk-taking and balancing personal work with making money. The thoughtful questions and the stamina of the audience told me they truly appreciated the combined breadth of experience in front of them. 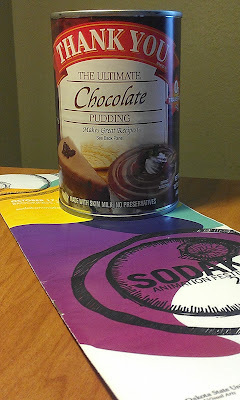 The evening ended with the presentation of cans of Thank You® Chocolate Pudding and packets of meat sticks from the campus meat lab (also home of the gummy bear brats) were nearly as good, especially when Steve tore open the meat sticks and began dipping them in the chocolate pudding. Mmmmmm… really, it wasn’t half bad. If I have sparked your interest in SoDak, the FAQs on the festival website offer a further glimpse into the lighthearted spirit of SoDak. They are worth reading, just for kicks. The festival is likely going biannual, so there will be no festival next year, but come 2015, don’t overlook this little gemstone in South Dakota. The ice cream really is amazing. Yep – it’s BBQ Time! Join us. Become an ASIFA Colorado member at the party at discounted rates — COME! Meet your fellow animators! Meet local illustrators and comic artists like Jay Peteranetz and Dan Conner at the Comic Book Classroom Kids Corral. Watch live drawing and illustration demos or create your own work of art. Tickets available for purchase over the phone, (303) 604-2424 or in person at the Museum’s front desk. Looking for a local place to go after the event? Walk over to Odd13 Brewery for a Comic Con wrap party featuring food from the Mama Jean food truck and discounts for event attendees (pick up a flyer at the event). Please note that the WOW! Comic Con is a special ticketed event and the Museum will be closed to the general public on this day. Adults attending the event must be accompanied by children. As Animator, web designer, instructor and computer geek, Ed has produced, directed, animated and edited numerous short films through workshops and independent projects. His films have screened during film festivals the world over. Ed’s articles on animation have been published in journals such as CARTOONS, ASIFA Magazine and Animatoon. He recently completed a book about the 50 year history of the ASIFA organization. He founded the ASIFA-Colorado Workshop projects and has presented many workshops both in the USA and abroad. He has juried many animation competitions, such as Animazing, SkillsUSA and the Seoul International Cartoon and Animation Festival. Ed currently resides on the board of ASIFA, as President and also President of ASIFA-Colorado. Joey Buhrer was awarded a BA in Media Arts and Animation from the Art Institute of Colorado in 2006 and received the Portfolio Par Excellence Award for having the top portfolio in his class. He accepted a position with a small visual effects company in Los Angeles called Two Headed Monster, where he contributed animation for music videos and commercials, including work for Columbia Records recording artists The Decemberists and Def Jam recording artist Rev Run (formerly of Run–D.M.C.). In recent years he has relocated back to Denver and is currently working for Masque Publishing, creating animation and illustration for PC games as well as projects for AOL and Apple. Joey is also very involved in community based animation projects, including animation workshops for ASIFA-Colorado and the GI Joe Stop Motion Film Festival as well as several animation related mentorship programs. Currently Joey resides on the Board of Directors for ASIFA-Colorado. With over 12 years of professional experience in illustration and animation, Wes has a track record of producing extraordinary results for many national and community-based organizations. His clients have included New Life Cinema, Warner Brothers, Buena Vista Games, Simon & Goodman Picture Company and National Geographic. 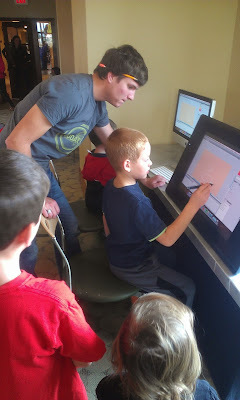 He was instrumental in delivering the Animation Station workshop during the 2008 Denver International Film Festival. He is a life long student of anatomy and animation and was awarded a Master of Science degree in Medical Illustration and Animation by the Medical College of Georgia. Currently, Wes is a freelance illustrator, animator and full time faculty member teaching under the Media Arts and Animation Department at the Art Institute of Colorado. Wes is on the board of ASIFA-Colorado. Corrie Francis Parks has shown her award-winning animated films on every continent except Antarctica, including heavy hitters such as Annecy, Hiroshima and Zagreb. She has met many of the ASIFA Board already through these travels. 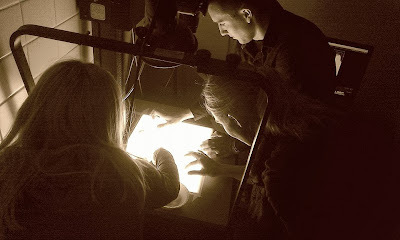 Working with with sand, paint on glass, cut-outs and hand-drawn mediums, Corrie hopes to further the global animation conversation through seamlessly blending digital and traditional techniques. Her latest sand animation film, “A Tangled Tale”, is currently on the festival circuit. She looks forward to the day when she can count penguins among her fans. Vaughn Johnson is a web marketer and freelance animator who is passionate about the history and art of animation. Prior to joining ASIFA-Colorado, Vaughn was a member of ASIFA-Hollywood for eight years. As an ASIFA Board Representative, Vaughn feels that his experience in the field and contacts in other ASIFA chapters can help promote ASIFA Colorado to in-state residents and the world at large. After his day job ends, Vaughn can be found at home working on his next animated short. Judy has taught computer animation, drawing and electronic imaging at the Art Institute of Colorado and Metropolitan State College of Denver and currently teaches electronic imaging at Regis University. Judy also works as an independent contractor doing technical computer visualization and animation for engineering firms, manufacturers, film makers, architects and large construction companies. Her personal art work ranges from large scale installation work to print-making and painting. Her recent fine art work focuses on combining traditional and digital printmaking techniques (a process she has termed Tradigital) and mainly deals with issues of personal transformation and identity. Judy holds an MH Fine Arts and Theater from University of Colorado and a BFA Graphic Design/Illustration from Northern Arizona University. She resides on the board of ASIFA-Colorado. Patrick Mallek is a 22-year veteran in the advertising industry and an award-winning animator. As a youngster he thought his calling was as an illustrator, a plan that was expanded when his mentor Curly Campbell told him he was an “idea man.” The ideas have been flowing freely ever since; to date, he’s written and directed over 50 animated shorts. His films have aired on MTV Networks and screened at countless festivals, nationally and internationally. He’s developed animation programming for Clear Channel Radio and Premiere Radio Network, has created wildly successful flash videos, feature film title work and music videos, and his animated shorts that have gone viral on YouTube. He is the animation director and juror for the Boulder International Film Festival and an active member of ASIFA. Patrick may or may not also have a black belt. With a gold buckle. A freelance animation director and instructor at the Art Institute of Colorado in the computer animation department, Evert has designed and animated for TV, film, CD ROM and the web. Evert worked extensively for studios in Hollywood with many different characters, primarily with Charlie Brown, Garfield, and Cathy. He has worked on forty-two television specials, hundreds of commercials, five full-length features, and has received an Emmy for direction of a “Cathy” television special. Evert’s mentoring has inspired many animators in the Colorado region and he continually seeks to improve and help junior and student animators. His interests surround the potentials of internet, animation, and teaching. Evert is co-founder and resides on the board of ASIFA-Colorado. On July 13th from 5-8pm be sure to join us at 209 Kalamath Street UNIT 7 (round the back), Denver, CO for some beer and pizza. Let us know if you have dietary restrictions. This is a FREE members-only event but feel free to bring a friend if they’d like to join up for a $5 discount. Bring any films or works-in-progress you may want to screen with the group. Also on tap, we will launch the election for new board members shortly after the event. More information on the duties involved are available upon request. If you’ve already put you name in the ring, no need to resend it (unless you’ve not gotten an acknowledgement). Up NEXT the annual Summer Cel BBQ. 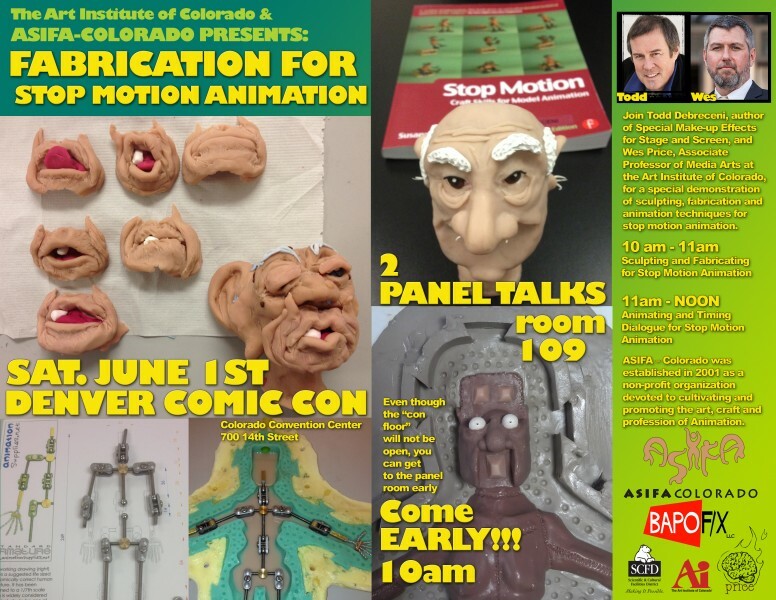 ASIFA Colorado will be at the Denver Comic Con 2013 with two presentation on Stop Motion animation. We’ll also have our usual Animation Station set up for those of you interested in trying out the craft. Stop by, check it out! If you’ve flown out of Denver recently, you probably noticed the eye-catching new jumbo screens wrapped around the towers above security. The were just installed by Clear Channel – yet another venue for media advertisement in public spaces. But thanks to the Denver International Airport Art and Culture Program, local media artists have elbowed there way into the digital space as well. ASIFA-CO’s own Corrie Francis Parks is one of the artists featured, with two works providing a whimsical, artistic “breather” from the advertisements. One piece Narrow Gauge, is a combination of expatiation and painted animation. The other, The Orange Umbrella, is a colorful paint-on-glass piece. A Frame from “Narrow Gauge” by Corrie Francis Parks, installed at DIA. The work will be playing at the airport through August, so now you have something to look forward to when you are waiting in those long security lines! If you don’t have plans to fly, you can also preview the two works on Corrie’s Blog. Last night at GASS 2013 everyone was a winner! First up was the announcement for the winners of the Animate48 Competition. Animate48 is a 48 hour animation competition where college level students were required to create an animated film based on the theme provided by ASIFA-Colorado. This year’s theme had the participants creating an animation with a Yeti, a thimble, snow, and a pair of sneakers. Second place had a prize of $250 and went to Kachina Rice. First place, with a prize of $500 went to Jeremy Encinias and Brandon Aragon. Judging was done by the ASIFA-Colorado Board. Next the Graduate Reels were shown. 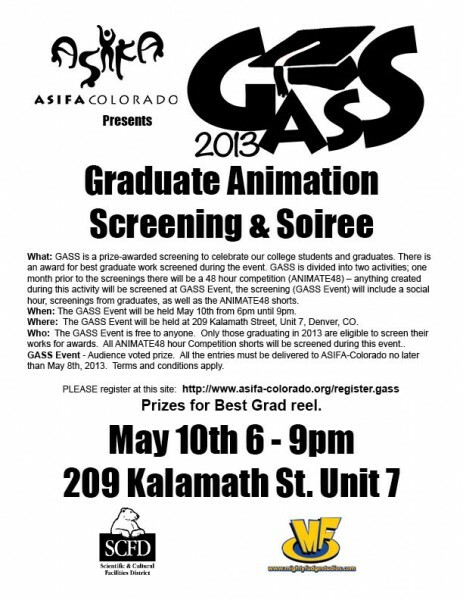 Graduate reels were shown to the audience which then voted on the best film of the graduates. Prizes included a top prize of $150 and a membership to ASIFA-Colorado, 2nd place was a $50 prize with a membership to ASIFA-Colorado and there were also a couple of runner-up prizes of $25 each. Congratulations to Joe McGrory for ASIFA-Colorado Best Animation Short with his film The Dollar Menu! Wayne Sullivan took 2nd place with his film Harpooned. First runner-up was Angelica “Jelly” Russell with her film, Candle Dance. And Sunrise Jaramillo took 2nd runner-up with her film, Moments Between Winter and Spring. Congratulations to everyone involved!